With the looming energy crisis, it is clear that we must revive the licensing of nuclear reactors by securing both their radioactive fuel and waste in use, storage, or transit from mishaps accidental or seismic; as well as from seizure or explosive scattering by terrorists. Separates off actinoids that can be used both as fuel for some reactors and as masking that would make inextricable those isotopes of Uranium (235) and Plutonium (239) of interest to terrorist bomb makers. If the generating reactor is such, then the actinoid portion would be kept for consumption on site. Seals the fission products that remain to reduce accidental, seismic and terrorist threats in transit and storage. I recommend a mobile processing laboratory that could spare the cost of building such at each nuclear site. 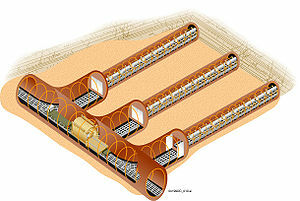 Its components would be hauled from plant to plant where they could be assembled and later disassembled. Several full vehicle loads may be joined into a large, functioning component; or one or more components, carried in a single vehicle. 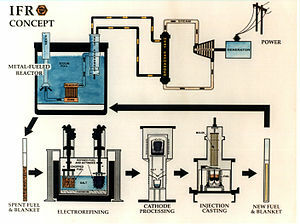 Currently the United Kingdom, France, Japan and Russia reprocess their spent fuel; but 28 years ago, the United States, concerned about the reprocessing byproduct, weapons grade Plutonium, as well as about the proliferation of that technology, prohibited it. This prohibition should be reconsidered in light of recent developments and unfortunately recent spread. The proposed Integral Fast Reactor could feed upon its own actinoid cocktail as well as those processed at other sites. 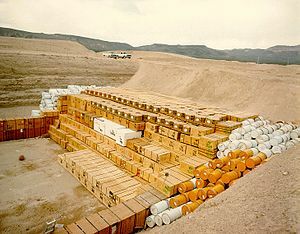 These cocktails would be of interest to terrorists as bases for radiological (not nuclear weaponry), but such is not really different from the current threat to all nuclear, power-plant fuel world-wide. By doing this on site, radioactive waste transiting the nation’s communities towards Yucca Mountain would be in smaller amounts and by greater fail safety. It would head out having been rendered to offer those communities through which it were to pass our best effort. Perhaps at some not so distant time, human ingenuity will have foreshortened the stays of strontium-90 and other fission waste at Yucca Mountain. This entry was posted in Cancer, Economics, Energy, Health, Physics, Terrorism, United States and tagged energy, nuclear, transit, waste. Bookmark the permalink.